Hi everyone. 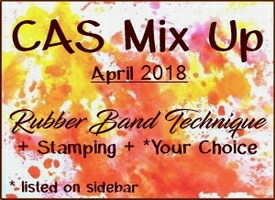 Today is the start of the CAS Mix Up April Challenge. This month's challenge is being hosted by the very talented Julia (Create with Me). Julia wants us to try the Rubber Band Technique. This technique has been around for several years. It's s fun and easy way to create some interest for a background or die-cuts. I have created a video on two different ways to do the Rubber Band Technique. I hope you'll have time to watch the video. If you like what you see, please give me a thumbs up! Thank you! In the video I show a couple of ways to do this technique ... with an acrylic block or with a brayer. 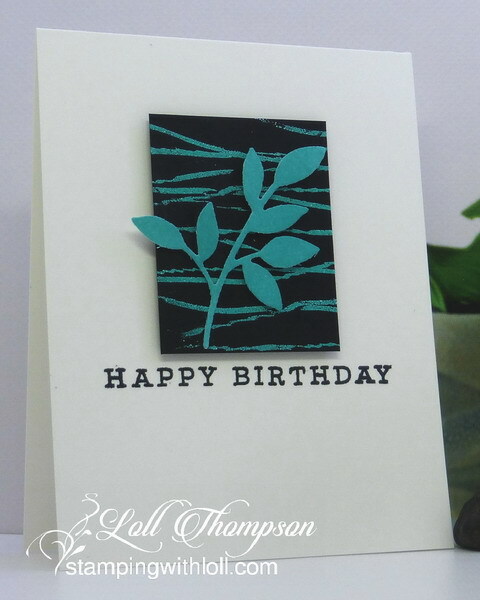 I used a brayer on the Happy Birthday card at the top of this post. I wrapped with three thin elastic bands, inked up with Versamark and rolled over a piece of black card stock that has been wiped with an anti-static powder tool. 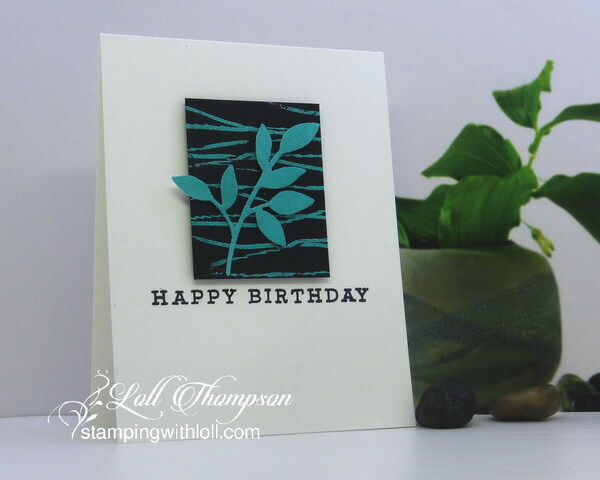 I sprinkled "Garden Patina" embossing powder from Ranger and heat embossed. Love this bright turquoise colour. The bands leave a wonderful, random design that adds interest and dimension. I sponged a piece of card stock with Peacock Feather's distress ink, die-cut the little leaves and added them over top of the embossing. I popped up the black panel, and popped up the leaves on my sprig (hard to see in the photo but there's lots of dimension). I stamped a simple sentiment in black to finish my card. I hope you'll come play along with our Rubber Band Challenge --- it's so fun and easy to do. Descriptions of my other cards from the video are in the post below. We are thrilled to have Hideko (Papercraft Boutique) as our Guest Designer this month. Please check out the challenge blog to see the cards make by the rest of the CMU Designers and our GD, Hideko. Then come play along! 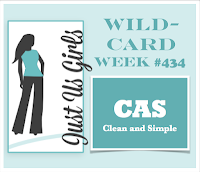 I'm entering the card above in the Just Us Girls Challenge #434 - CAS. Awesome! Can't wait to get into my studio!! Hopefully today. This is a brand new technique for me to try! Fabulous variety of cards with this great technique Loll. Lovely to listen to you and watch your latest video on this. Thanks for sharing. I'm IN!. Thank you so much for making and sharing your wonderful tutorial video, Loll! I wish I could give you many many thumbs-up! So inspiring! This one is my favourite of all the samples you show on your video - love the strong contrast of the turquoise over the black - great use of colour! A perfect background for the matching turquoise leaves! Now I'm off to find some rubber bands! The love the blue embossing and die cut on the black! Very classy and elegant with such an interesting design from the rubber bands! Love the video too! Two thumbs up! Very cool, I've never tried the rubber band technique. Thanks for the inspiration. What great use of the technique Loll - love the finished results! i have used this, and also have tried string around a block too. Gorgeous! I'm going to have to go study up on that rubber band technique - yours is amazing! Thanks so much for linking up this week at JUGS! Stunning cards Loll! I love the rubber band and how it makes such unique shapes for the background and the actual focal image! Awesome!! Oh my stars! What a cool technique with results that are simply sensational! Colours, the random design, the leaf spring...love it alllll! So delighted you shared your creativity in the Just Us Girls gallery! Such a fabulous color palette, Loll! This technique creates such a striking effect and works perfectly with your CAS design! I remember doing this technique years ago but without embossing. Watching your video makes me want to try all the different ways you used! Love how inexpensive this technique is and the fun results!